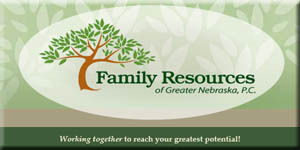 Family Resources of Greater Nebraska, P.C. I began working with Seanne Larson Emerton, the founder of Family Resources, in January of 2011. Seanne explained that she found their current website to be overwhelming; there was a lot of information, and the way it was spread out over so many menu items was cumbersome to site visitors. The site had been designed using a content management system (CMS), which was supposed to make it easy for them to update themselves, but quickly led to an out-of-control site. I met with Seanne and her office administrator, Becky Zebert, at their Grand Island office to determine ideas for the look and feel of the new website. The main concept was decided upon very quickly: Simplicity. The site needed to be easy to navigate without overwhelming visitors with menu options. (The previous site had over 75 web pages and nearly as many menu links.) We worked on trimming pages where possible, particularly by combining pages with little information, so that information could be found more easily without traveling to several different pages. We also changed the menu from a vertical menu to a horizontal menu, making access to submenus easier to navigate with a mouse. We implemented these "simplifying" steps alongside more modern and interactive touches, such as a mailing list sign-up and a Facebook newsfeed box, in order to create FRGN's sleek new site. Such a large site took some time to recreate and simplify, but the end result is one that will make visitors to the Family Resources website feel more at ease — and more likely to visit the site again.